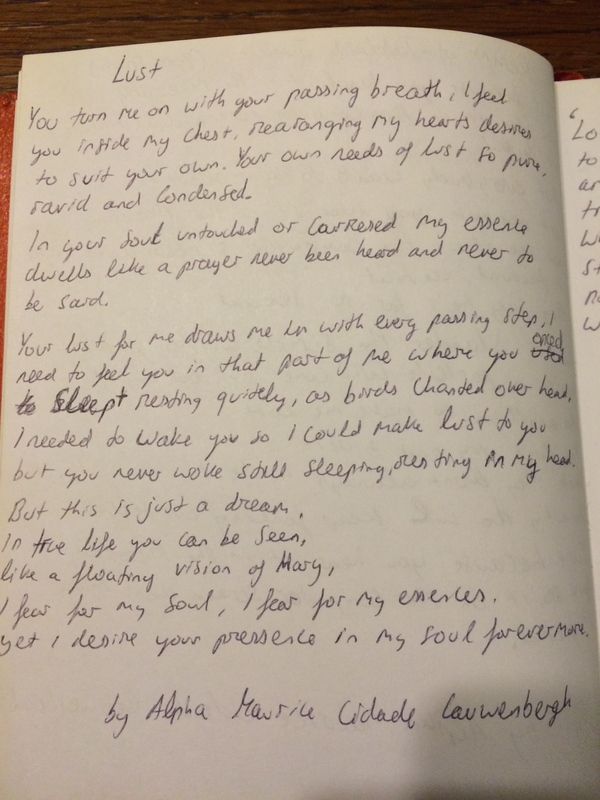 Scribbles of youth – Storyteller, Poet & Intern at Wordsmith Inc. Warning: These pieces are the workings of a very immature teenage mind and do not reflect how I write now. I can only apologise for the occasional obscenities and hope that you are not offended by any of them. I felt that to truly show my growth as a writer I shouldn’t censor any of my previous works, correct them of any major grammatical flaws or try to improve their poetic qualities in any way. Anyway, I hope you find it at least entertaining if nothing else. Each piece has been re-written beside the picture for easier reading. 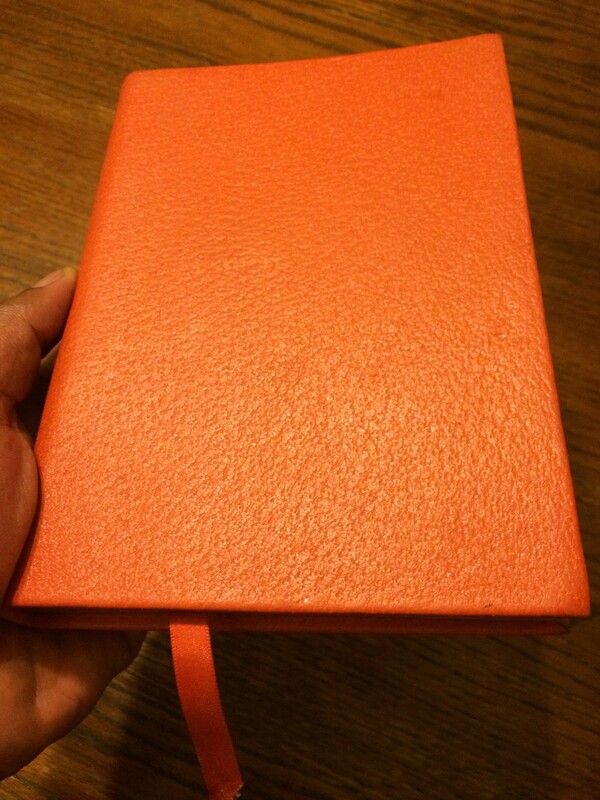 2002: The Journal my Dad got me for my 16th birthday…little did I know the weird and wonderful path it would set me on. 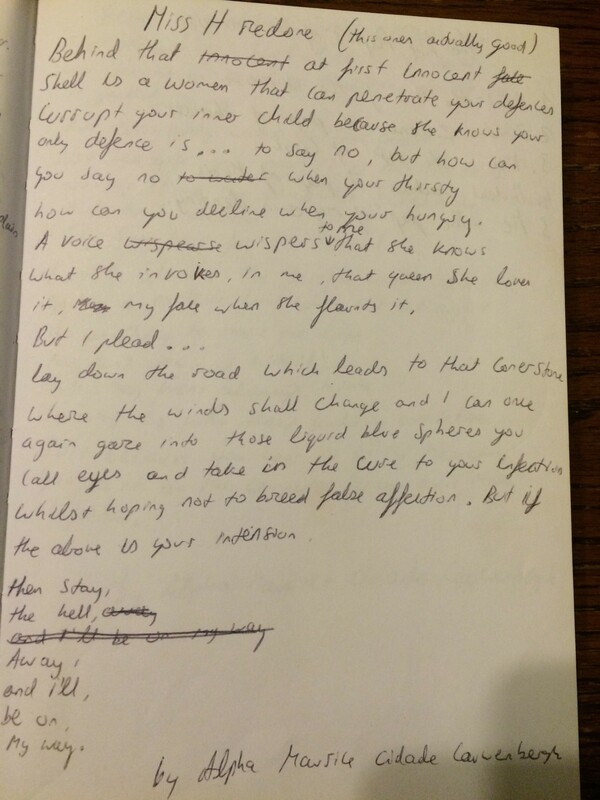 2004: This was one of the last poems I wrote in the summer before starting university. The exact inspiration for it I can’t remember, but I think it was just a combination of things I had experienced or seen, that got me thinking about how father’s and society tend to impose on boys what kind of man they are supposed to be. In a father’s case, this is sometimes borne of their own failed ambitions and/or a strict code of male behaviour. 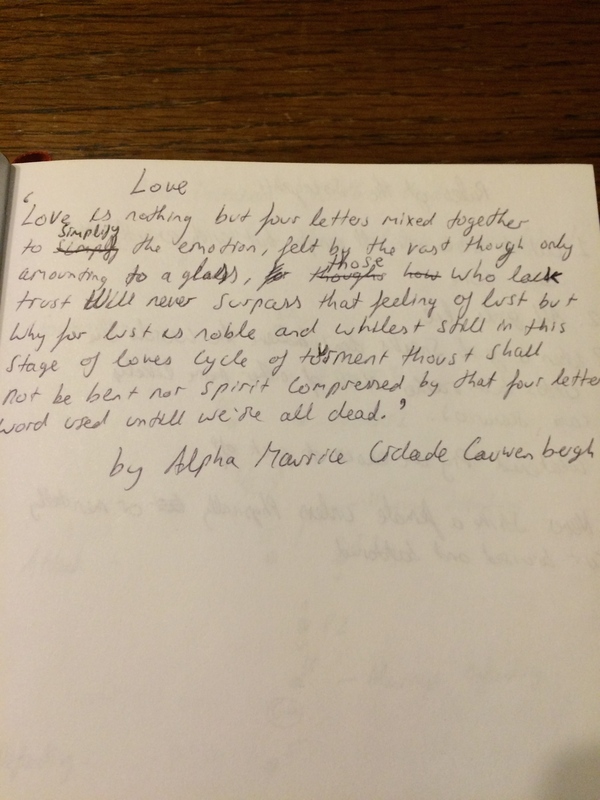 I’ve re-read it enough times to get over the initial cringes, and I guess it’s not too bad considering how much of beginner I still was to poetry. The man you’re supposed to be? It starts from birth, fathers try to imprint upon you the man they used to be. They can’t see the harder they try, the further you’ll fly, away from the centre of their life. They think, all in good time “he’ll see that I was right” as his voice echoes around the empty space you used to spend your nights. Your free now, to walk among the greats. You can breathe now, without his constraints. Before you just couldn’t concentrate! calm down you’ll have time to set him straight. Wait! you haven’t got I.D, without Individual differences what man are you supposed to be? How could this of happened? The social whispers told you to play sports you don’t like, to get drunk on Friday nights, gel your hair slightly to the right and try drugs if only for one night. Oh and get a tattoo, but one ever so slight. But even if whispers became screams you wouldn’t be able to see that this is not the man you’re supposed to be. You’d defend that sport you like, your hair’s slight lean-to the right, say that drinking is part of British life, how the drugs were just that one time and how that tattoo could only be seen from one side. Finally you’d repeat with seldom vigour that this is part of your unique I.D and how its the man you’ve grown up to be. Pay attention you f***ing d**k head you’re the same as everybody else!! 2003-2004: This embarrassing little piece was written about a particular girl who used to drive my adolescent mind crazy…but in hindsight, the truth of it all is a lot less dramatic. To say no, but how can you say no when you’re thirsty? how can you decline when you’re hungry? Lay down the road which leads to that cornerstone where the winds shall change, and i can once again gaze into those liquid blue spheres you call eyes and take in the cure to your infection whilst hoping not to breed false affection. But if the above is your intention, then stay the hell away and I’ll be on my way. 2004: A poem about my Lust, or at least how i saw it at that moment in time. You turn me on with your passing breath, I feel you inside my chest. Rearranging my hearts desires to suit your own, your own needs of lust so pure, raved and condensed. In your soul untouched or caressed my essence dwells like a prayer never been heard and never to be said. Your lust for me draws me in with every passing step, I need to feel you in that part of me where you once slept. Resting quietly, as birds chanted over head. I needed to wake you so I could make lust to you…but you never woke still sleeping, resting in my head. But this is just a dream, in true life you can be seen…Like a floating vision of Mary. I fear for my soul, I fear for my essence, yet I desire your presence in my soul forevermore. 2004: Another one of my attempts at a poetic definition of an emotion. Reading this back makes me feel like writing a new one, mainly to compare how my take on love has changed over the years…especially after being in several significant and painful relationships. But, also to improve on it. Love is nothing but four letters mixed together to simplify the emotion, felt by the vast though only amounting to a glass. Those who lack trust will never surpass that feeling of lust, but why? For lust is noble and whilst still in this stage of loves cycle of torment, thoust shall not be bent nor spirit compressed by that four letter word used until we’re all dead. 2006: This Poem was written for the first women I every truly fell in love with. It saddens me that this is actually the unfinished version as I’ve lost the rest…I think I wrote the rest on a completely separate piece of paper, why? I have no idea, doesn’t make much sense now. This section of it is still quite nice to read back but the full story of my affection and journey with her was so much more than the words in this portion. And as I don’t really remember the rest of the poem I can only hope that I managed to capture it all in the those lost pages. I am considering finishing it now…but i’m not quite convinced of the poetic merits of that…we’ll see. When I first laid eyes upon your moves, you seemed alone, unraveling melodies in your grove. Could I tell then of this future so crude? never because alone you were not but already dancing with my heart too. Contemplations arose whilst transfixed on your pose, when? now, later or never do I make you my cause? While I make my approach inside I suffer, with proximity to the source my resolve will stutter. Still beside you I stand entranced, with pupils fixed on your hips as you dance. Heart beats and seconds race as I try to define, the ways in which you make notes stand still in time. When is the moment right for me to join you? Do the processions of my intentions deserve you? When..? Now my heart screams, so my left foot proceeds, Alpha now! is the plea so my right foot concedes. Your rhythm never broken, your step never faltered as you accepted me into your dance, it took all but a moment for your endorsement, all but a moment for your glance. So fluid is the way that we move, spawn beauty it will, the sight of us soon. Like flickering flames under a full moon or the silhouettes of roses illuminated at noon. 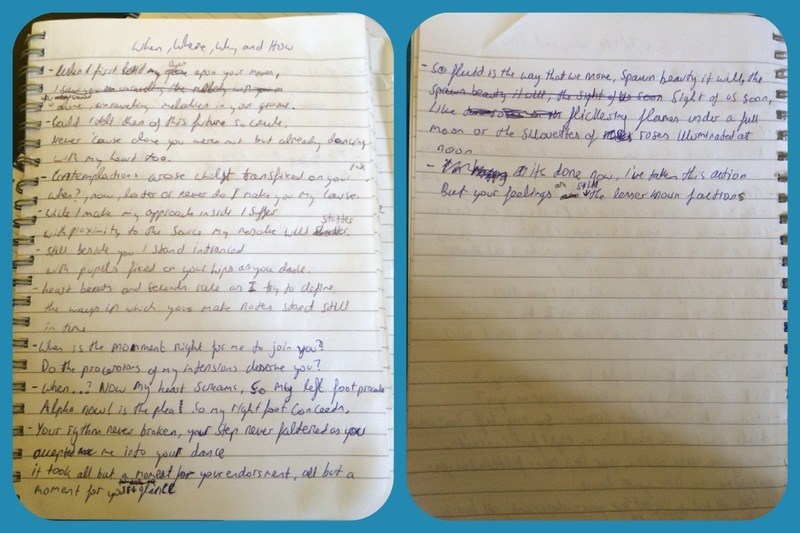 Pingback: Doing a spring clean and found a poem from 2006 about my first love | Storyteller, Poet & Intern at Wordsmith Inc.